Whether you’re new to the educational publishing scene or a seasoned expert, you’ve probably noticed that successfully making a profit off legacy textbooks is much more difficult than it used to be. The reasons for this are many. Students are strapped for cash, and options like Amazon rentals and used textbooks are too enticing to pass up. Publishing new editions each year has been an effective tactic in the past but as students continue to struggle financially, previous strategies may not be enough to fill the gap. So, what’s a poor publisher to do? 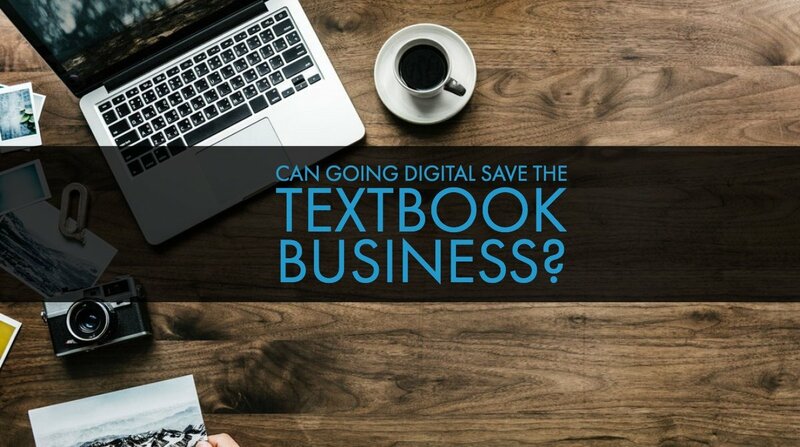 Can going digital really save the textbook business? Spoiler alert: The answer is yes! Moving your textbook business into the digital realm has countless benefits. Here are just a few of the reasons you should give digital publishing a shot. The average consumer in 2018 has at least 3 devices. Despite cost limitations, mobile devices, tablets, and laptops are most popular with consumers between the ages 18-24…AKA, college students! As the huge generation z comes of age, the demand for digital learning material will boom alongside them. The numerous benefits of digital content aren’t lost on these up and comers. Features like interactive material, stress-free self-assessments, and easy-to-use study materials are hugely appealing to today’s undergrads. The portability and flexible nature of digital textbooks is also a huge plus. Students love digital textbooks, so publishers should too! Textbook only stay relevant so long. Try using a 2010 edition of a science textbook in a 2018 classroom and you’ll quickly find it’s devastatingly outdated. Because of the availability of new, easily accessed information online, information loses value even faster than it used to. Hardcover textbooks can only be updated by publishing a new one. New math strategy created? New textbook. New mummy uncovered in the ice of Antarctica that rewrites human evolution? New textbook. With a digital textbook, however, information can be updated and added as needed. This saves publishers valuable time that could be spent creating new, innovative content. Especially amongst the younger market, trends have substantial influence on consumer choices. Teens and young adults want what’s new. iPhones are frequently replaced the second Apple comes up with a new, slightly improved model. Often, these upgrades are done when the old phone still works! Similarly, old textbooks still “work”, but why would students choose them when there’s something new? Digital textbooks are still a fairly new concept. The more this idea is developed, the more attention it will gain from students and educators. Legacy textbooks still serve their original purpose, but students now expect more than words on a page. While old-fashioned textbooks still impart information just like they used to, that’s about all they can do. The design and layout of a book can be improved, but the function, usability, and value are mostly unchanged. Because of this, you can only offer consumers slightly different versions of the same product. Digital textbooks, however, are a different product altogether. While they offer just as much information as their hardcover counterparts, they also offer customizability, quick access to additional educational resources, built-in note taking, quick collaborations, interactive learning modules, and so much more. The possibilities of where digital or hybrid learning programs can go are endless. 5. More Affordable- for Everyone! The “starving college student” doesn’t want to pay extra for books. For many of them, new textbooks are now a luxury. As sad as that is, offering a more affordable option is hugely beneficial to struggling students. Online textbooks are an average of 50% less expensive than a hard copy of the exact same textbook. That’s a big difference! Without the cost of materials and printing labor, it’s more cost effective for publishers, too. Same information, better deal. Getting started with digital publishing is easier than ever. With state-of-the-art authoring platforms like those offered by Gutenberg Technology, you’re one step closer to running a thriving digital learning company. If you want to stick with the tried and true, continue publishing traditional textbooks. On the other hand, if you want to grow your business with an avant-garde, creative, and limitless new method of publishing, the door is wide open.